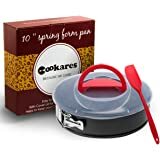 MAKE CHEESECAKES AND MORE: Everyone loves cheesecake, but this springform pan can handle so much more. 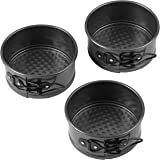 Try making Three Cheese Italian Rigatoni Pie, Peach and Blueberry Greek Yogurt Cake or Garlic Cheese Pull Apart bread. The possibilities are endless. 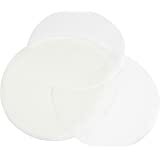 NON-STICK SURFACE: Made of steel wtih a non-stick surface and reinforced coating for easy release and quick cleanup. 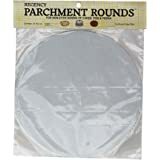 HEAVY WEIGHT: Made from heavy weight material for long-lasting baking, and easy release. You’ll love making your favorite springform pan recipe ideas for friends and family. 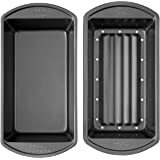 USE AND CARE INSTRUCTIONS: This baking pan is dishwasher safe; however, for best results, hand-wash in warm, soapy water before first and after each use. Rinse and dry thoroughly with a soft cloth. 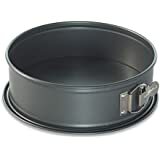 Each pan is covered by Wilton's Limited 10-year warranty. 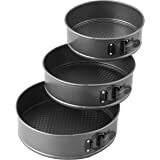 If you cook and bake most of the time, you need bakeware that will hold up day after day. 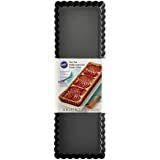 Our Perfect Results line is great for everyday use with its heavy-duty cold-rolled steel construction, durable non-stick coating and oversized pan handles that make it easy to go in and out of the oven. 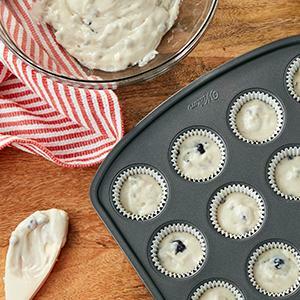 Choose from muffin, loaf, pizza or cake pans, cookie sheets or even mega-sized pans for bigger baking jobs. Each pan is also dishwasher safe. 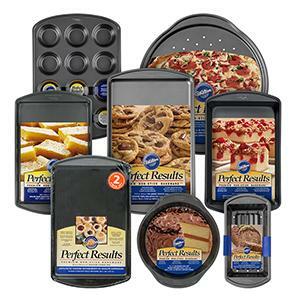 Perfect Results Premium Non-Stick Bakeware will be your go-to in the kitchen. 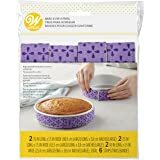 Wilton Perfect Results Premium Non-Stick Bakeware has a super-durable non-stick coating for easy release of foods and quicker cleanup. 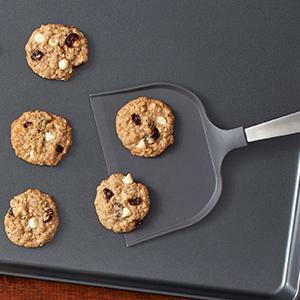 Larger handles on our Perfect Results pans make going in and out of the oven easier, especially with oven mitts. 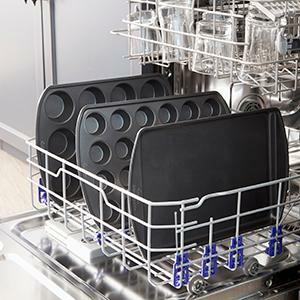 All Perfect Results pans are dishwasher safe, meaning you don't have to spend a lot of time in the kitchen cleaning. Cheesecake, anyone? This 10-inch springform pan will set you up for success when making one of these creamy, dreamy desserts. 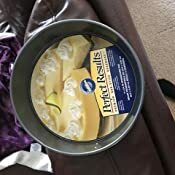 This item leaked cake batter all over my oven first time using it. Additionally, it has a lip that batter gets stuck in which is very difficult to clean. Took several attempts with a tooth pick to get all of the cake batter out of the lip to clean. 5.0 out of 5 starsDoes not leak!!! 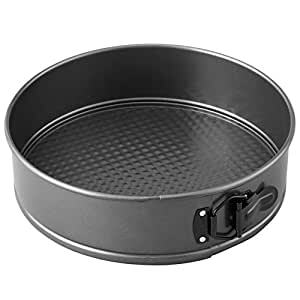 This cake pan is awesome. It did not leak! The metal is nice and heavy, not flimsy. I am very happy with this purchase. leaks like a bugger, the water just pours out of one side. i attempted a cheese cake but had to wrap 3 layers of aluminum foil around the pan and one heavy duty all tucked inside, which made a mess of the side of the cheese cake after it cooled. i thought w/purchasing an old reliable name like Wilton, i would have gotten something that does pour the water out of the bottom on the pan. the pan cleans up nicely, but then again, the whole thing had to be covered in aluminum foil. 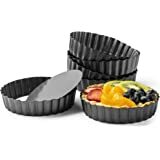 i may just try using a regular round cake pan, at least that won't leak and the foil messes up the side of the cheese cake after it's cooled anyway... disappointed in this product. 5.0 out of 5 starsCheeeeeesecake! I'm pretty kitchen savvy and I LOVE to bake but one thing I had never really tackled was a cheesecake. 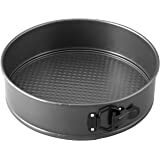 So I decided to take one on for Christmas and ordered this pan. It worked perfectly. I didn't get any leaks into the cake while it was baking in the water bath. It released well without hesitation and cleaning was a breeze. Definitely recommend it. it's a good pan, my cheesecake came right off of the sides and bottom with ease. NO need to run a knife around the edges. 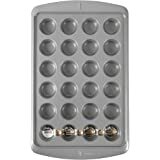 The bottom has a square raised pattern (as seen in the photo), i'm assuming this helps with releasing the cake (instead of a flat bottom). Easy to clean after use. The material seems solid, like it will last a long time if cared for. Please note that the detail/description states that there are handles (the picture doesn't show them, but I wasn't sure if that was because of the angle of the pic), There are NO handles on this item. It's not just the Amazon website details that states there are handles. 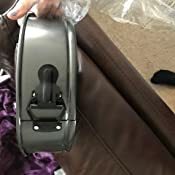 When I received the item the packaging label also states there are handles, when I contacted the manufacture they said some of their items have handles (ok). The label is specific to this springform pan so there label is clearly wrong. 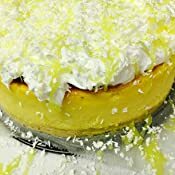 5.0 out of 5 starsPerfect for cheesecakes! 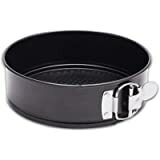 I use this spring form pan when I make cheesecakes. Nothing sticks to it and the quality is top notch. 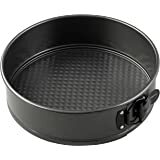 Easy to clean and I believe I will have this pan for many years to come! I bought 2 of these and used them twice. Both times they leaked and created a huge mess in my oven and filled my home with smoke.